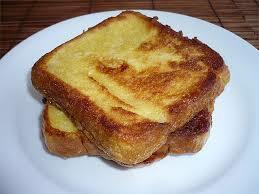 French toast is kind of a staple in our family. Grandpa used to tell me that Grandma traveled all the way to France in order to get the recipe. I think he liked that I believed it. I mean, where else would French toast have come from? Smart lady, right? And she wonders where I get it from. She was right, but sometimes, we’re afraid to give away our love. It isn’t as easy and endless as it sounds. Loving someone means to hand yourself to them, knowing their imperfections, their perfections, their mistakes, their triumphs… their everything, really, and then wholeheartedly accepting and deeply appreciating each of those. This is why love is something you can’t take away. This is why, when it is given, it is something that has the potential of eternally residing within its recipient, unconditional and irrevocable. It’s scary because giving or sharing our love is like giving up a piece of us and investing it into someone else. It’s scary because it means trusting or hoping that your love won’t be returned at half-value, like a stock ravaged by a downward spiraling market of irresponsible and selfish spending. It’s scary because, no matter how much we don’t want to admit it, when we love unconditionally, we hope to be loved unconditionally in return, and no matter how much we try to convince ourselves otherwise, sometimes the thought of never loving is more enticing than losing it all together. I finished my French toast—all three pieces—warmly sitting in my stomach, which has, by this point, become a seemingly boundless resource in my family, symbolic of years of morning meals with Mom and reminiscent of Grandpa’s comedic stories. Or maybe it’s symbolic of love, quickly warmed and readily consumed, washed in warm milk and sprinkled with cinnamon sands that rush over our taste buds. And maybe we truly have nothing to fear—nothing to fear about love or loss—because when the French toast is gone, Mom can always make some more.